Honeybees form a complete colony by collecting themselves into a deep cluster and keep warm by vibrating their wing muscles. 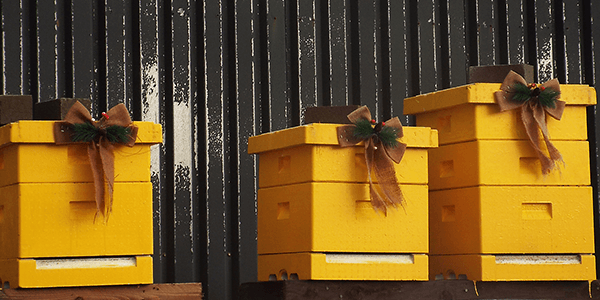 They use the honey they have generated as a source for energy to fuel this – which is why they produce honey in summer and autumn months in the run up to winter. But if beekeepers harvest these honey reserves, what do they use instead? Beekeepers will replenish their hives with a sugar solution substitute derived from beet or cane sugar which is mixed with water. The bees drink the sucrose and through a process called inversion, they produce essential glucose and fructose for fuel – similar to how they convert nectar to honey. 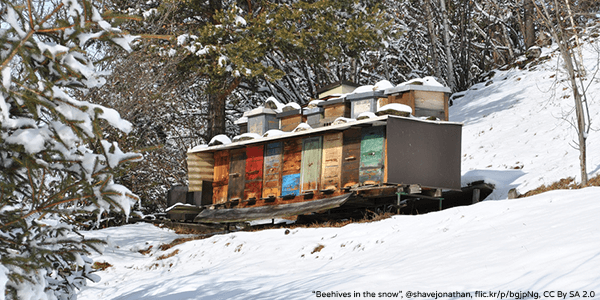 The beekeeper will return in January and February to check how his little charges are doing and if they need more of the substitute – lifting the lid very quickly so a minimum amount of cold air gets in. The bees will remain in this state until fresh, local pollen starts to be released from trees and plants which is when they will leave their hives to seek springs new blossom.